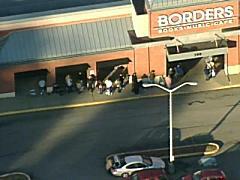 These poor people waited in line beginning at as early as 5:00 a.m. for an Express Lane Meals book signing by Rachael Ray that was supposed to begin at 4:30 p.m. Unfortunately, Rachael cancelled the signing because she is sick and rescheduled the signing for June 3. About 200 people had lined up and they sold out of tickets in 30 minutes. How appropriate! If you are really bored, you can see video of people standing in the line to meet Rachael here. Rachael is greeting these crowds, despite feeling a little under the weather. She didn't want to speak on camera, because she's nursing a sore throat. But hey, she's an expert at these types of events. This is her 13th book. I hope you feel better soon, Rach!